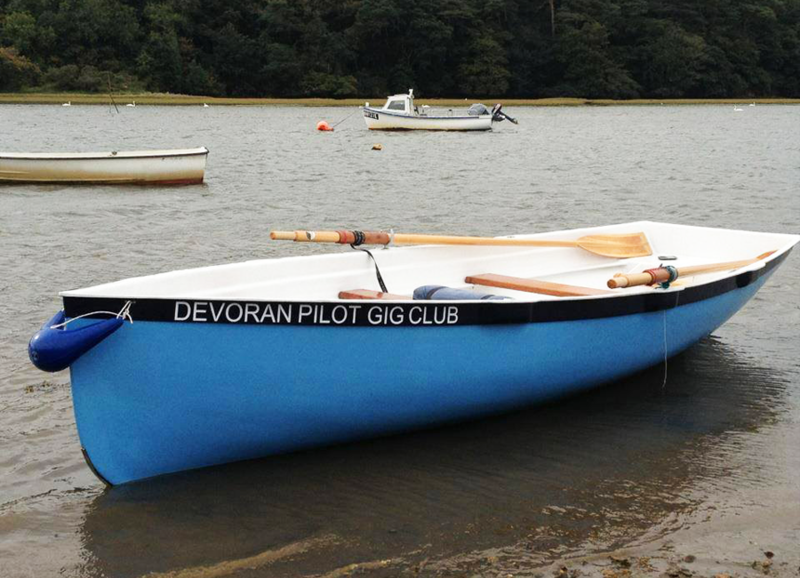 Devoran Pilot Gig Club is based at Restronguet Creek, off the Carrick Roads near Falmouth. 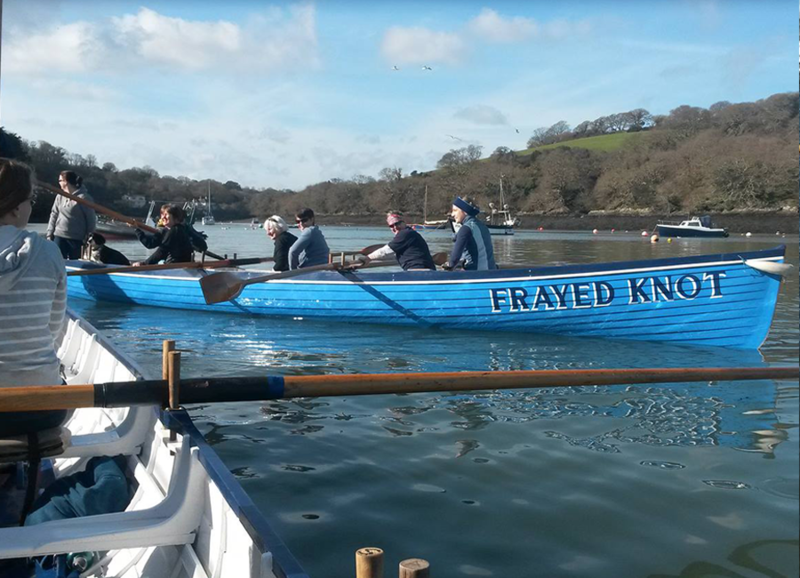 Our Club was formed in 1989 and has a membership of around 70 and we have three traditionally-built Cornish pilot gigs, Faith, Falcon and Fear Not, plus a 'plastic' (fibreglass) training gig 'Frayed Knot' and our skiff, 'Pandora Express'. Our crews compete regularly throughout the intensive racing season organised by the Cornish Pilot Gig Association as well as in local "friendlies" such as the Friday Carrick Races. 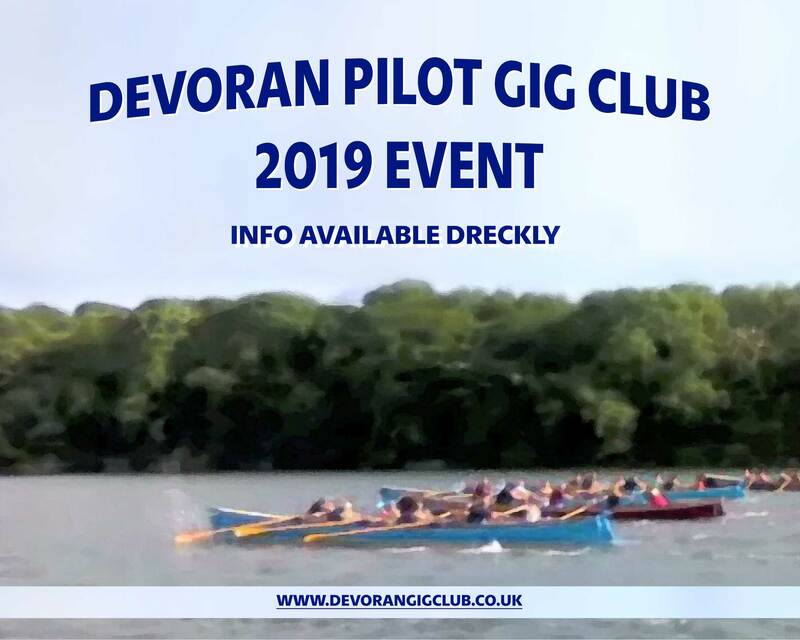 In addition to the season's racing, and also the local Friday Night Races in the Carrick Roads, we also regularly take part in extra events and gigging adventures such as rowing the Caledonian Canal in Scotland and competing in the Thames Great River Race. In recent years we've had Vets and Super Vets crews participating in both the Diamond Jublilee Pageant and also the Brest Maritime Festival! We welcome all new and novice rowers and would love to see you on the slip. 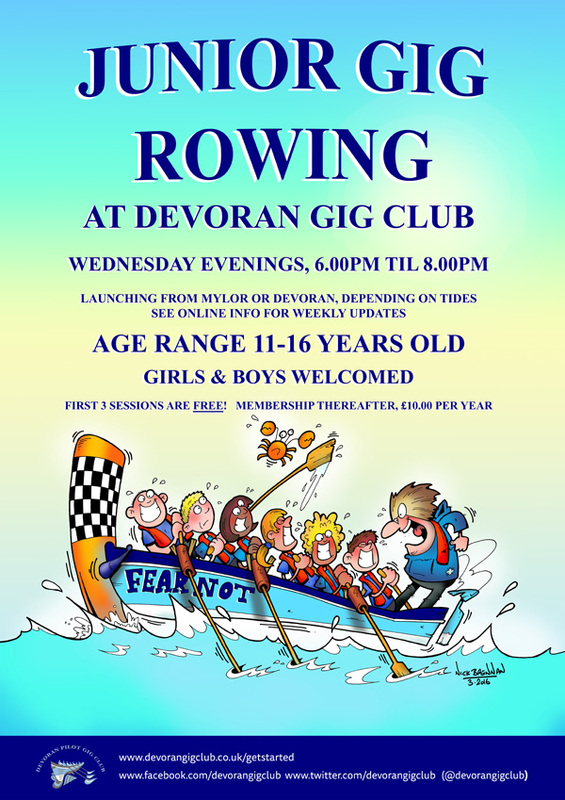 Our weekly sessions for everyone who'd like to give gig rowing a go. We're now running to our Winter schedule. Sunday mornings 10.00am - 12.00 noon. 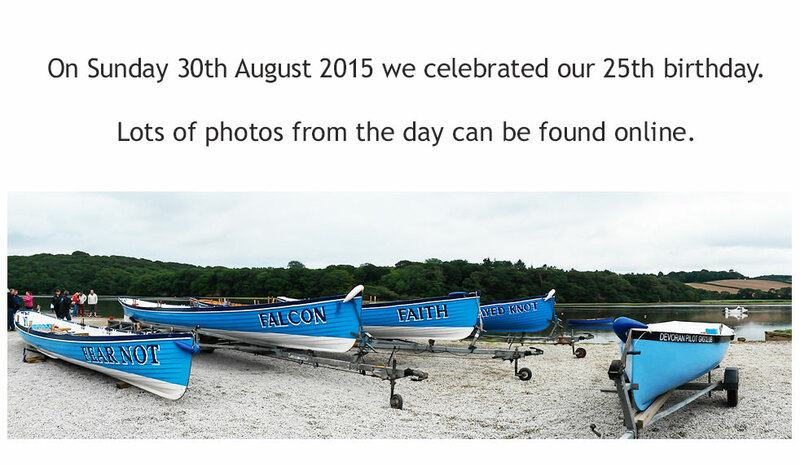 Venues: Mylor Harbour or Devoran Quay Check Twitter for weekly info. and for last minute info about any of the sessions please check our Twitter feed by scrolling further down. Login for information on crew training and event etc. Built by Ralph Bird of Devoran in 1991. 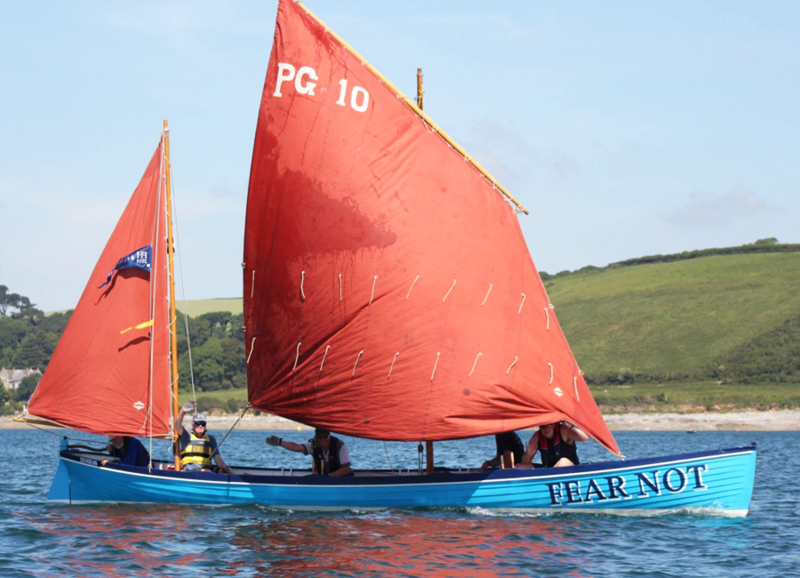 Cornish pilot gig, Fear Not, is one inch narrower than standard but rather heavier as she is rigged for sailing. She's named after an historic Devoran gig. Built by Andrew Nancarrow, Bissoe, in 1998. Built by Maurice Hunkin at Fowey, 2008. Devoran's 'plastic'. Our fibreglass training gig, purchased by the Club and officially blessed and launched in August 2014. 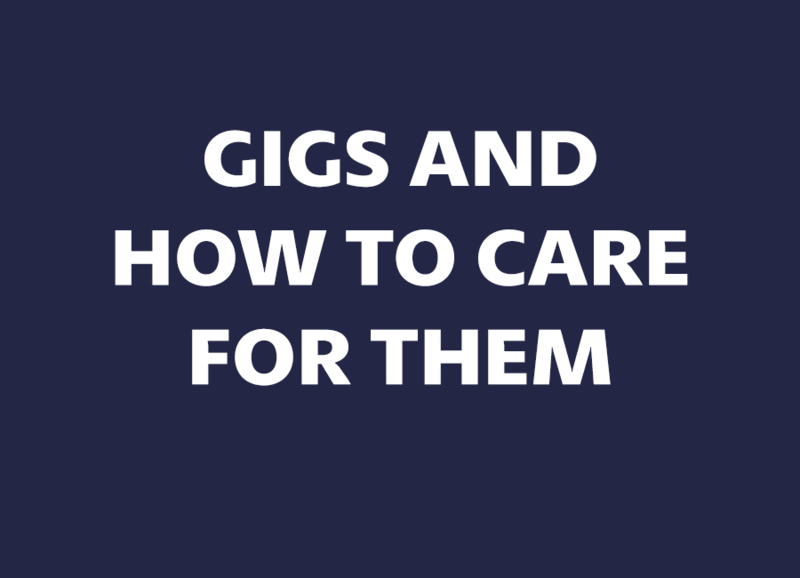 Some time ago I wrote some information articles on the care and use of gigs. Since that time many new members have joined the club and Committee felt it would be useful to have the articles repeated. First though it might be helpful to have a little gig history. Though our gigs are always referred to as Pilot Gigs delivering pilots was only one of their many roles. Ralph Bird, the Devoran gig builder who built Fear Not in 1991, always referred to them as the white vans of the coast as they were used for all the many marine jobs found in harbours, ports and at sea. Their design slowly evolved and eventually became the gigs we know today, superb sea boats, light enough to be rowed and handled by a pick up crew from their home port and yet being able to carry goods and passengers when required. They did of course race each other to incoming vessels in the hope of winning the piloting work and they achieved some astounding passages. After landing the pilot on the ship most were able to carry some sail so that the prevailing South Westerly wind from behind helped to blow them home. Of course if you have two similar boats at sea together there is always going to be a race and gigs soon began to compete at regattas, the gigs themselves often being sponsored by, or built by, local businesses. Boat builders incorporated their ideas as to what would make their gig faster or more sea kindly. As the years went by, as more modern craft took over their role, gigs were beached and abandoned until soon pretty much only Newquay Rowing Club was still racing their three gigs, the oldest Newquay built in 1812, Dove 1820 and Treffry 1838. 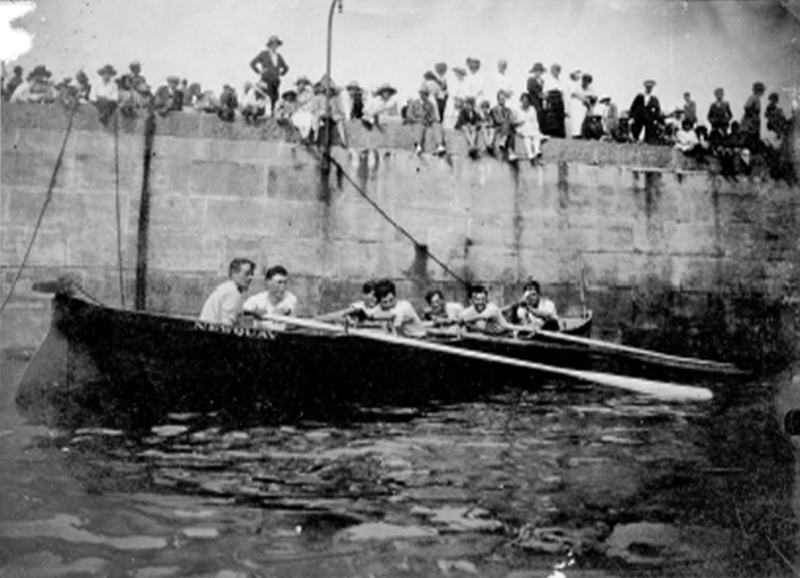 This is a photo of the gig Newquay in 1932 with my Uncle Roper rowing stroke, 120 years after she was built. Until the1950's all three Newquay gigs were painted black, as I imagine were most gigs elsewhere, black being cheap and readily available unlike coloured paint. Few gigs survived in use after the Second World War but Newquay's gigs were fortunate since they were selected to be used to train sea cadets during the war in a unit based in Newquay Harbour. This at least kept them watertight and in use. In 1953 the Newquay, now painted red for the first time, was towed up to London for the first post war International Boat Show, being exhibited alongside that years University Boat Race boat, the oldest and newest race boats of the time. There being no specialist gig trailers in those days she went up on a flat bed truck towed by a tractor. Also in the 1950's far sighted business men in Newquay, Sue Mountford's father among them, realised the historic value of gigs and began to catalogue the survivors, eventually voyaging to the Scillies where they bought the Slippen, Bonnet, Golden Eagle and Shah. These gigs were in varying states of disrepair and neglect so prices were low from £25 to £35 each. The Shah came from the family of our club's Jenny Smith for £35 and a bottle of whisky. Once back at Newquay the gigs were repaired one by one, raced by Newquay and some years later returned to the Scillies where they still race. Those gigs were the beginning of the Gig movement we know today, when every pond or inlet seems to have a gig floating on it. As the Gigs and clubs multiplied wise heads realised that to keep the sport as regulated as possible a design standard had to be agreed and at a meeting at Ralph Bird's home at Carnon Mine the Cornwall Pilot Gig Association was formed. The Association drew up measurements for various sections of the gigs and also laid down the materials, for example narrow leaf elm for the planking, that could be used. The measurements were taken from the Newquay Gig Treffry which was acknowledged to be the finest gig ever built. Treffry was built by William Peters at St.Mawes and like her fellow gigs Newquay and Dove, is still raced. As described previously the design of our gigs evolved over the years into the beautiful, fantastic sea boats we all love. What we have to remember is that their design and entire structural strength relies on them being supported by the sea they float in and that poor handling or incorrect storage ashore can cause serious damage. That being so it follows that we need to take especial care when our gigs are being launched, recovered or ashore and some simple rules will ensure that they are treated properly. Allow the voice of the cox or whoever is taking charge to be heard, please make sure everyone listens to the instructions and follows them. Never try to launch or recover short handed. Seven crew is the minimum needed. Please always wear shoes you are prepared to get wet. It not fair to ask the few who have such shoes to pull a gig in on their own. To do so risks damaging their backs and straining the gig if there are not sufficient numbers to beach her carefully. Reduce the weight when launching or recovering by removing paddles and kit. When launching or recovering please take your time. Smooth and steady is the rule. Ensure the trailer is correctly positioned. Bilge supports down, trailer tail struts down and locked, and wheel chocks in place. Use the rollers or big fenders if you need to move her over ground to the trailer or over a beach. Once the gig is on the trailer raise the bilge supports. until they are touching and supporting the gig but not rammed hard up. Tie down straps should be tight but not ratcheted up hard which can distort the gig. Bow (front) rope and tie down straps must always be used when a gig is to be towed. Paddles must be secured to the thwarts (seats) on the foam cushions which should be on thwarts 4 and 6. The ends of the blades of the paddles lightly touching th coxe's seat. If possible wash out the gig. Covers on. Gigs need to be damp to retain their watertight integrity, they must not dry out. In very hot weather we are advised that rather than leaving the front and back of the cover folded back it is better to leave the cover on but to put a bucket of water inside the gigs when ashore, off the trailer, on a beach, slip or in storage. Make sure that the length of the keel is supported, either by the land or on fenders or timber. No more than 3 feet of keel should be clear of support. Put the frenchmen (the triangular wood supports) firmly but carefully in place but make sure that they are supporting the gig at her bilge pieces. Use their lanyards (ropes) looped over a pin to stop them floating off or being dislodged. 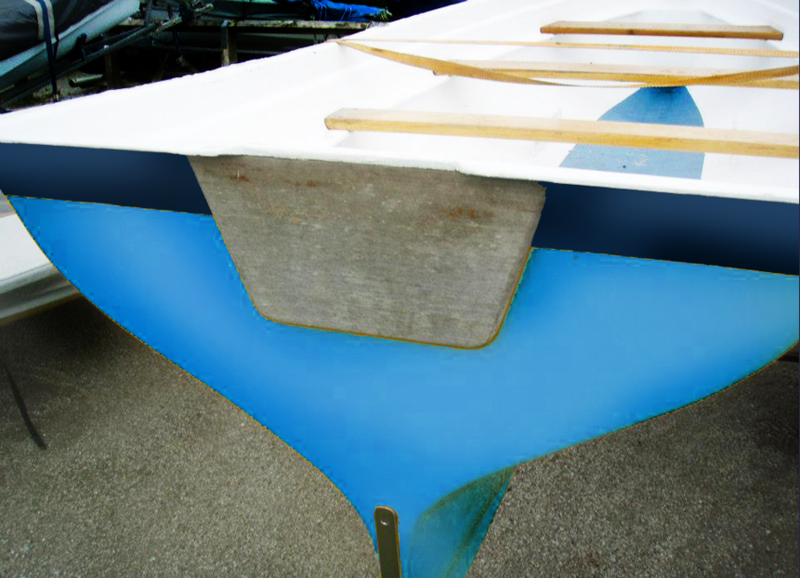 Paddles must always be cushioned on the thwart sponges or timber when out of the gig, never on the concrete or stone of the slip or dock. As previously mentioned the structure of a gig requires it to be supported by the sea so... on no account should anyone climb into a gig when she is ashore as to do so imposes stresses she was simply not designed to accommodate. The timber of a gig is very resilient but in order for it to remain so it must be protected by paint or varnish and clearly anything we do which knocks off paint will allow damage and water ingress to the timber. Please wear the correct footwear and knock or wash off grit and sand before getting into the gig, or change shoes. Stones and grit damage paint. Wellington boots with cleats are not a good idea since the cleats can hold stones. Do not stand on the thwarts when getting in or out of a gig. Doing so puts all your weight through one foot onto a structural timber only designed for sitting on. You will also fall a long way onto an unforgiving surface should you lose your balance. If it is difficult to get into the gig from a pontoon sit down on the pontoon and place your feet on the bottom boards. If getting out hold out your hand for someone to pull you up (grasp each others wrists for extra grip and safety). Be careful when moving paddles around in the gig. They are heavy pieces of timber and can easily bruise or knock off paint as well as crew. Do not jam the paddle handles under the gunnels (top edge of the gig) when at rest. This damages the paddle handle which you are then going to have to grip but also knocks paint off the gunnel. Put the handle under your knee or ask a fellow rower to hold your paddle. Never push off or fend off with your paddles. This damages varnish and scars the timber. Use the fending off poles. Coxes must not sit on the cross piece at the stern. This was simply designed to take the end of the mizzen sail bumkin which slotted through the hole in the transom (back timber of the gig). It is there to conform to tradition, is simply not strong enough to be sat on and if sat on puts stresses far up on the gig side planking which it was not designed to cope with. If coxes are worried about forward vision when leaving or entering a dock then sit on the safety box which must always be kept behind the cox. 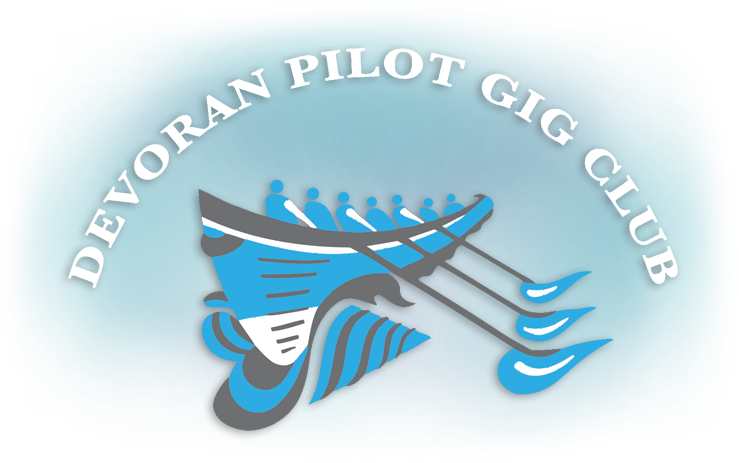 It should be part of the pride of being a Devoran Pilot Gig member that our gigs always look well cared for and are handled sensibly. 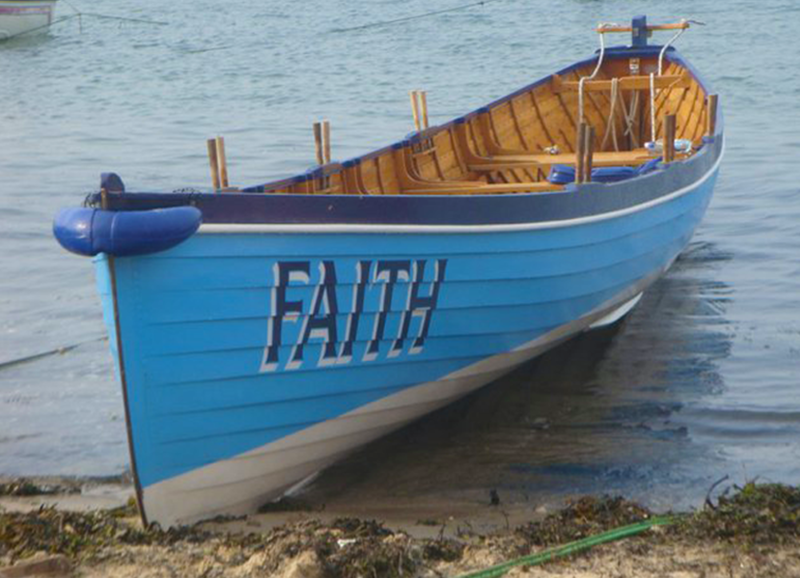 Our fibreglass skiff, purchased by the Club in 2013. Our Novice Sessions are run on a completely informal, drop-in basis (no need to let us know you're coming, just turn up) and they are free for a trial period. They exist to give people a taster of what gig rowing involves and an opportunity to familiarise themselves with the gigs and the basic rowing technique. We also cover intermediate level rowing during the same period, meaning that people can get a lot out of these informal sessions before they necessarily have to decide whether they want to go the whole hog and become a paid up club member. All novice rowers go out in boats that are crewed by our experienced, club rowers and are safely skippered by our coaching coxswains. We cater for a wide age range. You're never too old - and at the other end of the scale we have experienced, DBS-checked juniors' coxes. What we generally do is relay crews out in short runs with an aim to get everyone two or sometimes three go's out per session. That way those new to the sport can have a breather and use the in-between time for a bit of reflective chat about how they got on, which side they preferred rowing on etc. etc. Do bear in mind, though, that depending on the numbers attending any given Novice Session we occasionally go out for a longer row... and just so's you know, we pretty much always go out no matter how inclement the weather may seem! Don't miss out on having a row just because it happens to be raining. We'll be out there! If you're ever not sure, simply check our Twitter feed. As far as clothing's concerned, anything you feel comfortable in and that you feel allows you a good range of movement is fine. People row in everything from teeshirt and jeans to lycra all-in-ones to Mackintoshes! We really are quite a mixed batch! Feet can sometimes get wet hopping in and out of the gigs; so any old trainers, shoes, or sandals that you don't mind getting an occasional soaking are ideal. There can be a reasonable amount of standing around as we relay the crews in and out for their go's; so it can pay to wear a warm top layer (a fleece or something similar) that you can take off after you've been rowing for a few mins. Do note, even on chilly or wet days you'll find yourself getting pretty hot when rowing; so do wear a cool, bottom layer, like a tee or vest, that you can strip down to if needs be. We look forward to seeing you - we're a friendly lot. Gig rowing's the best sport in the whole wide world and you've found the best club in the whole wide world to try it at! The trial period runs for three sessions after which, if you've enjoyed it (which you will!) you can decide on what sort of membership you'd like to opt for. Full details can be found by clicking here. Maintaining the clubs purpose and direction within the constitution; chair of all club meetings having a casting vote only. Ensuring the club has regular meetings and is promoted and run to its best possible potential for the future. Chairman shall hold office for a maximum of 4 years consecutively. All matters concerning the clubs finances, to ensure the production of audited accounts for the Annual General Meeting and to keep the committee regularly updated on its financial situation. Examples of when you should contact your Treasurer? * When you have collected monies which need to be paid into the club bank account. * When you need authorisation to spend money on behalf of the club. Liaising with other clubs and the CPGA. Replying to other clubs' event invites. Booking committee meetings and keeping the minutes up to date. Sending out newsletters once a month, keeping members up to date on happenings in the club and within the CPGA. Examples of when you should contact your Secretary? * If you ever want to read committee meeting minutes. * If you have a question about another event or our own event. * If you wish to bring something up with the committee for discussion at a meeting. Examples of when you should contact your Membership Secretary? * If you have a query about membership fees. * If you need to update your membership details (change of address etc). All operational matters concerning the boats and rowing. Coordinating rowing/training sessions, in particular club night and novice rowing. Ensuring boats are in the right place and arranging towers. Part of the selection sub-committee for the club in conjunction with respective captains and coxswains. Can generally be found in the Ladies' crews, Club/Novice Rowing, and at all socials. Examples of when you should contact a Rowing Officer? * To book a boat for an unscheduled training session or social row. * With any queries relating to Club or Novice rowing. Promoting the sport of gig rowing within the club by assessing, motivating and organising members in accordance with their individual goals and abilities. Encouraging a competitive spirit, whilst maintaining a social aspect for all to enjoy. Ladies' crew selection and organising coxswains for relevant crews in conjuction with coxswains and the rowing officer. Arranging and co-ordinating training schedules as appropriate either on or off the water. Can generally be found in the Ladies' crews, at Club/Novice Rowing, and at any socials. Examples of when you should contact your Ladies' Captain? * If you have any queries about ladies' crews. * If you find yourself unable to attend a training session. * If you have any queries about on or off water training. Men's crew selection and organising coxswains for relevant crews in conjuction with coxswains and the rowing officer. Can generally be found in the Men's crews, at Club/Novice Rowing, and at any socials. Examples of when you should contact your Men's Captain? * If you have any queries about men's crews. Promoting enjoyable gig rowing for all, especially those almost past their peak of physical performance, both in competitive racing for veterans (over 40) and social rowing, including coastal explorations and hostelry assessments. Selection of veterans` crews in cahoots with coxes and the other captains. Can occasionally be found in the Old Quay Inn, Devoran, at events or training sessions. Examples of when you should contact your Vets' Captain? * If you think you may be over forty but can't remember. * If you would like to come out with the vets. * If you can't attend a vets' crew session. Juniors' crew selection for competitive events. Examples of when you should contact your Juniors' Captain? * If you have any queries about Junior's crews. Ensuring that the correct and timely maintenance of all club equipment takes place. Can generally be found in the Men's crews, Club/Novice Rowing, and at all socials. Examples of when you should contact your Bosun? * To report any damage to the gigs, oars, radios, lifejackets etc. or any malfunction relating to the above. * If you have any queries about boat maintenance. * If you have any queries about boating procedures. * If you have any questions about club equipment. Ensuring that we can enjoy gig rowing in a safely. This involves keeping club members aware of the safest way to enjoy our sport, keeping the radios charged and keeping the contents of the safety box up-to-date. If you have any concerns or queries please feel free to get in touch with me. Examples of when you should contact your Health & Safety Officer? * If you have a concern about the safety of the boats and/or crew members. Ensuring compliance to the CPGA policies and procedures for child protection and should be the person that any concerns are reported to. Examples of when you should contact your Welfare Officer? * If you have a concern about yourself, or another person. * If you require a CRB clearance. The welfare officer and junior coordinator/coxes hold junior members emergency contact details and medical information. 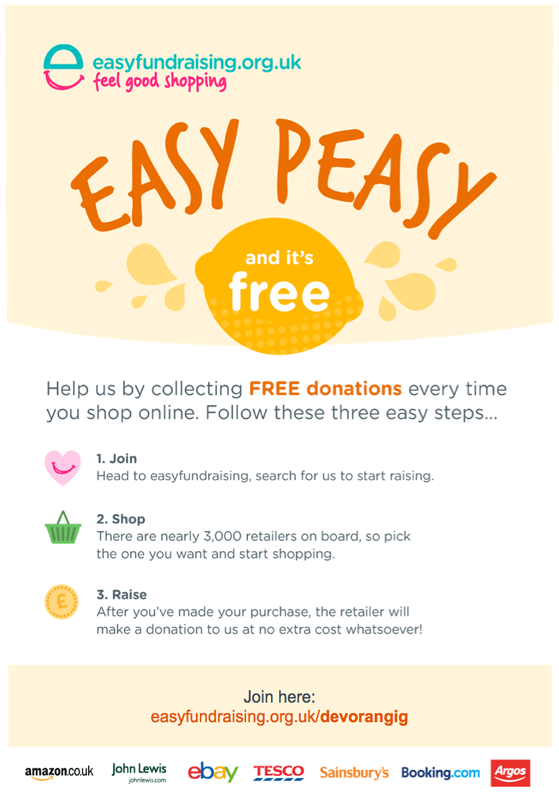 Examples of when you should contact your Fundraising Officer? * If you have an idea for a fundraising event. * If you know of any grants or sponsorship that we may be eligible for. Design, hosting and maintenance of the club's online presence and the enforcement of Club fun! Can generally be found at Club socials. Examples of when you should contact your webmaster? * If you're experiencing difficulties relating to accessing or viewing the website in general and/or the members' section in particular. * If you find any bugs or anomalies regarding the club's online presence. * If you're experiencing difficulties finding or following us on Facebook or Twitter. * If you have an idea for a good knees-up.